Simpo PDF to Excel is a professional PDF converter to convert batch PDF documents to Microsoft Office Excel files. This PDF tool preserves all text contents,tables, formatting and layouts from the original PDF documents to Excel spreadsheets accurately. What's more, Simpo PDF to Excel supports to convert PDF to Excel in two modes - Partial and Whole, with which you can not only convert a whole PDF file to Excel. 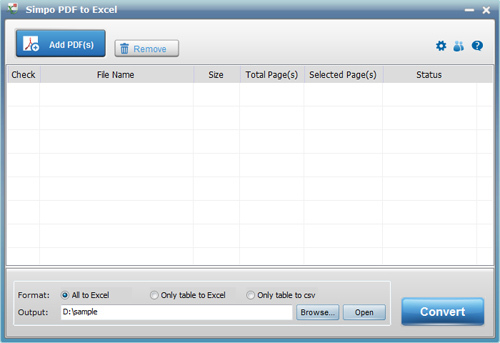 PDF to Excel Converter is used to convert PDF files to Excel documents. ...... Moreover, Simpo PDF to Word is a standalone application, so you could run this program independently and needn't extra install Microsoft Excel, Adobe Acrobat or Acrobat Reader. Like all Simpo PDF products, Simpo PDF to Excel provides you an intuitive interface, which is popular for both experts and beginners. Just two clicks: Import files, click "Convert" and done! The interface of Simpo PDF to Excel Converter is friendly and easy-to-use. Even if you are a novice to computer, you can use it to convert PDF to Excel easily, just add PDF(s) -> click Convert button, you PDF files are converted to Excel spreadsheets soon. Simpo PDF to Excel Converter not only preserves the original text contents and tables from original PDF files, but also converts each PDF page to separated Excel spreadsheets so that you don't need to reformat the converted Excel files. Qweas is providing links to Simpo PDF to Excel 1.1 as a courtesy, and makes no representations regarding Simpo PDF to Excel or any other applications or any information related thereto. Any questions, complaints or claims regarding this application Simpo PDF to Excel 1.1 must be directed to the appropriate software vendor. You may click the publisher link of Simpo PDF to Excel on the top of this page to get more details about the vendor.